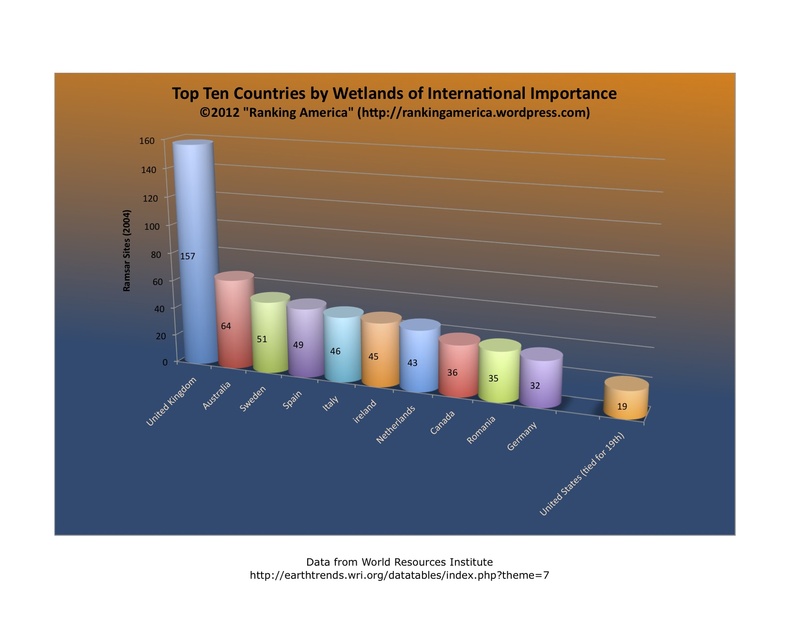 According to the World Resources Institute, there are nineteen wetlands of international importance in the United States, which makes the United States tied for nineteenth with India and Pakistan in that category. The United Kingdom ranks first with one hundred fifty-seven internationally important wetlands. 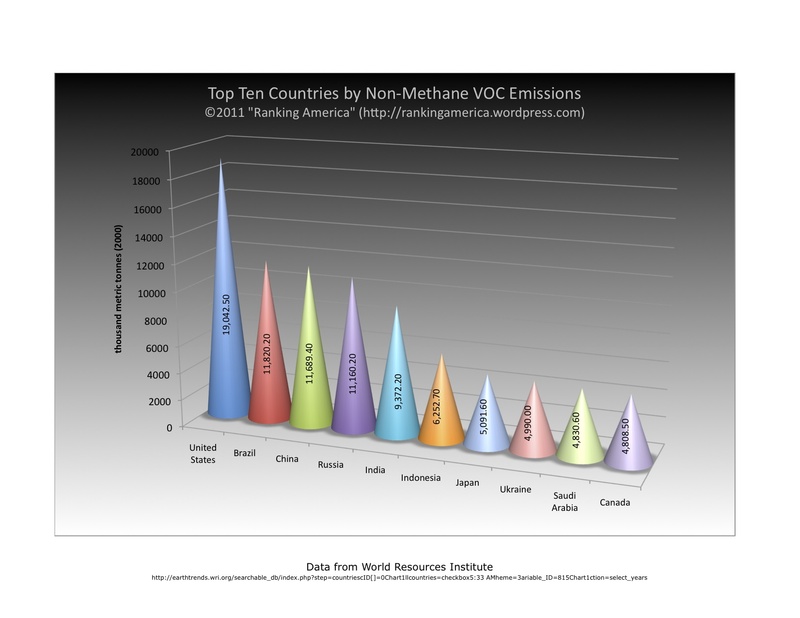 According to the World Resources Institute, in 2000 (the most recent year available on their website) the United States emitted 19,042.50 metric tonnes of non-methane volatile organic compounds, which is enough to make the United States rank first in that category out of 217 ranked countries. 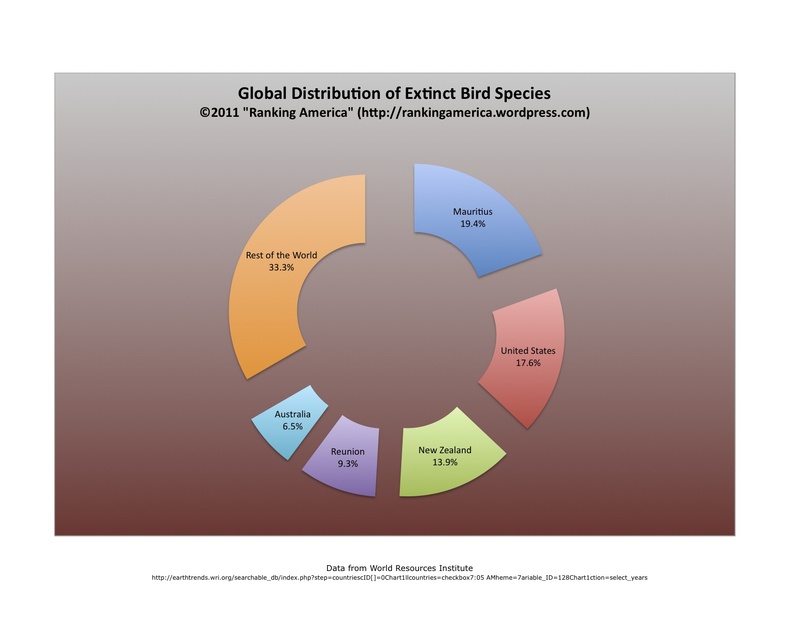 According to the World Resources Institute, there are nineteen extinct bird species in the United States, or 17.6% of all extinct bird species, which makes the United States rank second in the world in that category. Mauritius ranks first, with 21 extinct bird species, or 19.4% of the world’s total. According to the World Resources Institute, there are 195 amphibian species endemic to the United States. That is enough to make the United States rank seventh in that category. 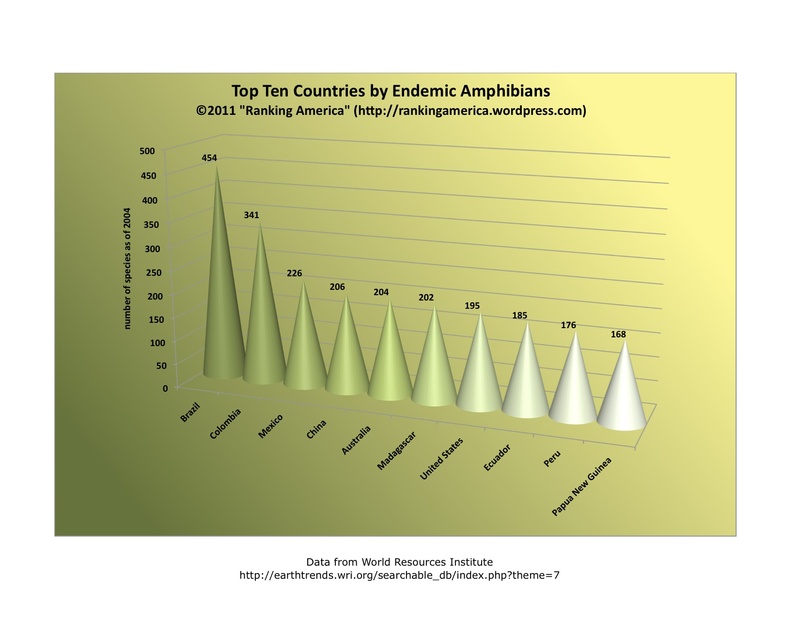 Brazil ranks first, with 454 endemic amphibian species. According to the World Resources Institute, in 2003 there were 662,000 mechanical agricultural harvesters in use in the United States, or 15.6% of the world’s total harvesters, which was enough to make the United States rank second in that category. 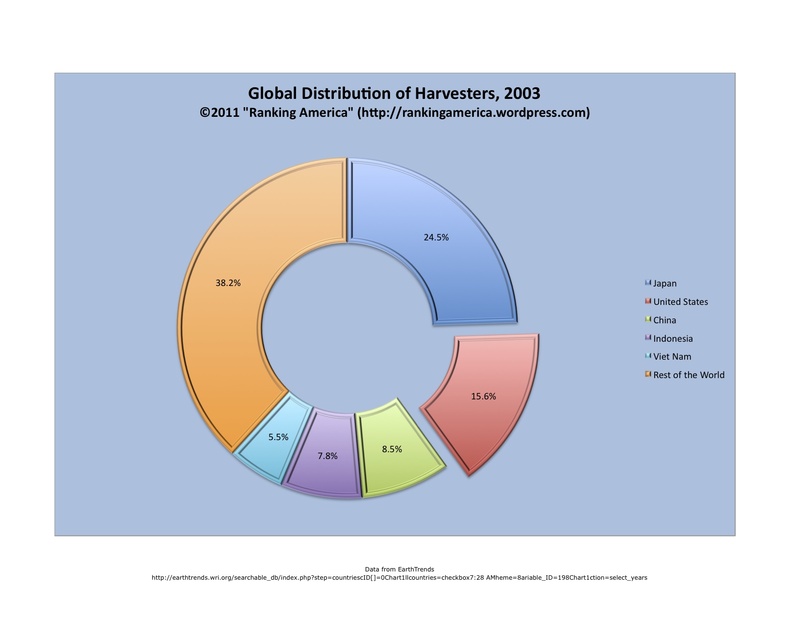 Japan ranked first, with 1,042,000 harvesters, or 24.5% of the world’s mechanical harvesters. 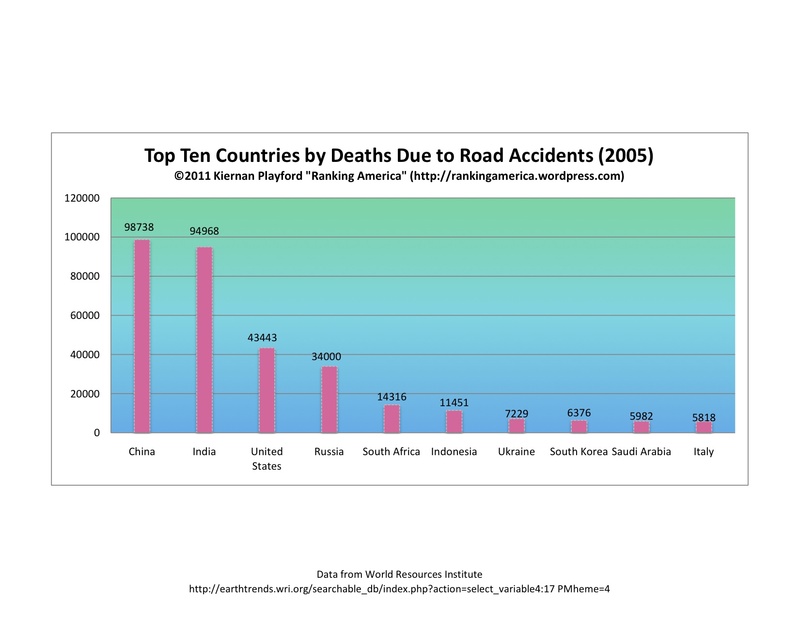 According to the World Resources Institute in 2005 the United States experienced 43,443 deaths due to road accidents. That is enough to make the United States rank third out of seventy four countries ranked in that category. China ranks first with ﻿﻿98,738 deaths due to road accidents. 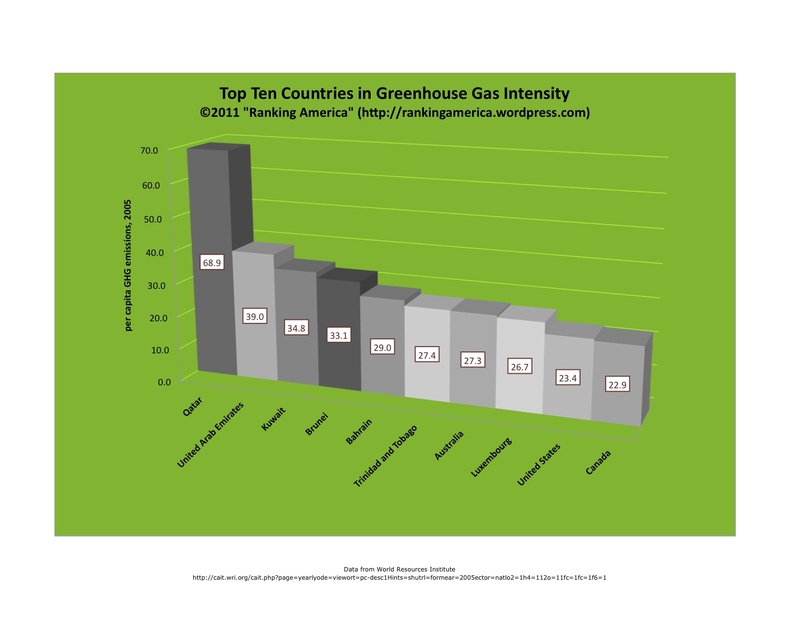 According to the World Resources Institute, in 2005 the United States emitted 23.4 metric tonnes (CO2 equivalent) of greenhouse gases per capita, which makes the United States rank ninth out of one hundred eighty-six countries ranked in that category. Qatar ranked first, emitting 68.9 metric tonnes per capita.